Why do I love soup? It's easy to make, inexpensive, one pot can feed many, and it's filling. Why does my husband not care for soup? I don't know, but I still make it! One day I did not have vegetable broth at home, however I decided to make soup anyway... so I used water. How can you get flavorful soup without veggie broth you ask?! I figured it out, and so will you. Most of my soups start out with the same base; different seasonings and vegetables are added to create different versions. 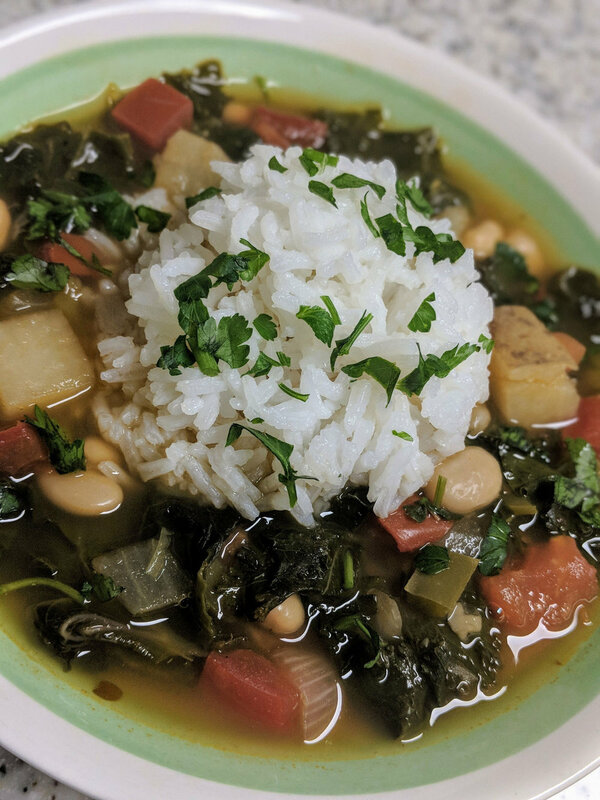 Here is my white bean and kale soup. If your soup is missing something, it probably needs more acid. Try adding more lemon juice or tomato sauce, even a little rice vinegar if you have it on hand. Be careful if using vinegar, adding too much will affect the flavor of your soup. Once oil is hot add the peppers and onions. When the peppers and onions start to soften add the garlic. Stir often as garlic burns quickly. Cook for 2 minutes. Add the salt, black pepper, smoked paprika and italian seasoning. Add the water, liquid smoke, tomato sauce and nutritional yeast. Bring to a boil. Add the kale and let simmer for 10 - 15 minutes. Once the kale begins to soften add the beans. Cook for 5 minutes. Add the potatoes and simmer. Check for doneness after 6-7 minutes. When the potatoes are almost fork tender turn off the heat as they will continue to cook and will get mushy if they cook to long. Add the lemon juice and hot sauce. Taste and adjust seasoning if necessary, I usually end up adding more salt at the end. Serve with rice and garnish with fresh parsley.